It's not much different than the last photos I posted, so nothing too exciting. The only difference is there is a finish on the maple and I trimmed the ends of the stretchers. But, she's done. At last. Somehow, I think my next project will be much more simple. And smaller. And way, way lighter. So beautiful! You must be relieved and proud. Thanks for all the detailed build notes! Thanks, upriver. I'm very glad to be finished. I do plan to post more about the construction process. I didn't stop too often during the build to do that. Nancy, there's a SAPFM meeting in Maryland this weekend. Wanna go??? That is a beautiful bench!!!!! Love the bench Kari! Now you've got me thinking a split top might be the way to go. My stash of oak has been laid up for 3 years, almost time to start thinking about actually starting construction. What was your finishing recipe? BLO/varnish mix? Something else? Wow, that is one piece of inspiration. Good for you to have the gumption to get through it all. Well done! The chop is just gorgeous. It reminds me of your level. Thank you, Morton. Hope you get to start on your bench soon! rootertooter, it took about four months. I bought the lumber in September but didn't really start planing until December. Once I started, I worked on it every single weekend and many evenings until now. Joseph, I wouldn't change a thing about this bench. The split top prevents the end assemblies from pulling apart when the top moves with the seasons. You have to add short stretchers beneath the top of course if you do the split top, but it's not that big a deal. mwh, I used minwax wipe-on poly which is an oil/varnish mix (I'm pretty sure). It dries really fast (2 hours) so you can apply three coats in a day. Craig, a couple other folks commented about the leg vise and level, too. I hadn't thought of it, but there are similarities. 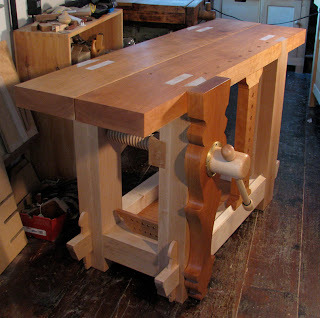 I was actually looking at the legs of my sawbuck table and a French bench I found in an antique store for inspiration. Greta looks beautiful! With her now finished, tomorrow's Chesapeake SAPFM meeting can be her debutante "coming out" party! Looking forward to seeing it and having your fellow SAPFM members oh! and ah! over it. Any thoughts on why your photos don't show up in google reader? Stunning work - you should be very proud! Bert, I'm picking up her "coming out" gown at the cleaner's today. I haven't, Shannon. The cherry top is soft, but not that soft! Brian, sorry--I don't know. Maybe because I shortened the RSS feed so it doesn't show the full story? Have you given any thought to publishing measured drawings for your rendition of Roubo? I'm sure glad I built before you. You raised the bar so high everyone will get a nose bleed trying to even get as high. Very, very well done!! Even Sylvia is extremely impressed. Great!!! Il est magnifique ce Roubo! djmueller, I don't know that you'd need measured drawings for this bench. 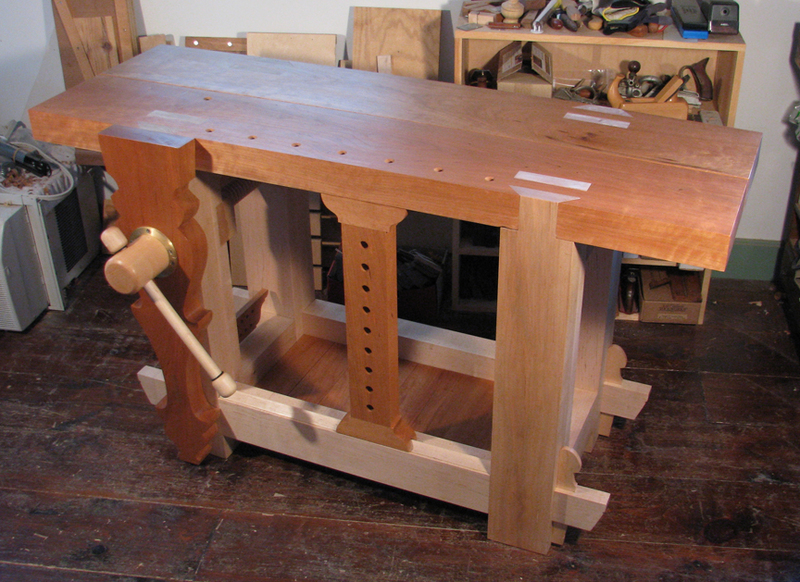 It's pretty straightforward and follows a regular Roubo design except for the two-board top, extra short stretchers to support the top, and tusk tenoned long stretchers. Vic, your bench build helped nudge me along. 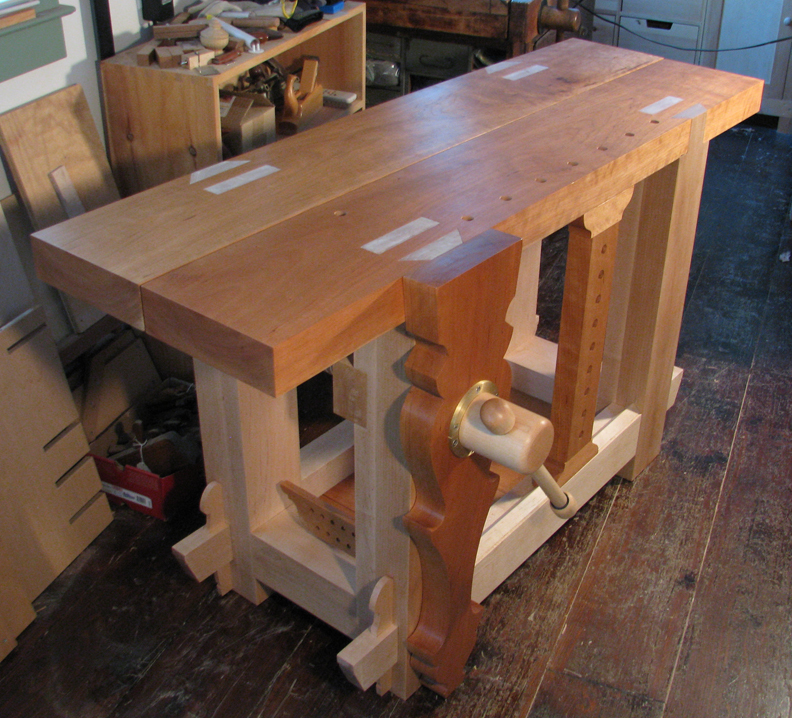 It was exciting to see each phase of your construction, and it got me energized to build my (tiny-compared-to-your) bench. Your workbench could snap mine in half like a twig. It may be complicated and heavy; but looks great. That's what I'm talking about :) Why the beautiful tendency of decorating dies. Even such a practical workbench MUST be beautiful. I think that it cames with working with hand, you can't really leave things flat and bland, they must be beautiful!